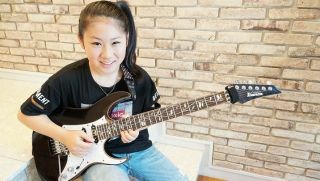 Watch 13-Year-Old Guitarist Li-sa-X Shred an Original Song, “Little Wings"
The young phenom will release her debut album, 'WILL,' October 26. Youngshred phenom Li-sa-X has released a preview of the title track from her debut EP, Serendipity, and it’s streaming below. Li-Sa-X is an 11-year-old Japanese guitar phenomenon whose YouTube covers of virtuoso rock guitar classics, includung Racer X's "Scarified," have racked up seven-figure viewcounts. The last time we saw guitarist Li-sa-x, she was starring in her first commercial, where she shredded Schubert’s “Lullaby” for Japan Net Bank, using a bank-issued debit card as her pick. Well, Li-sa-X—who is a whopping 10 years old now—is back with a new video. In it, she takes on the Polyphia track “Aviator,” shredding up a storm as always. One or 2,457 of you might remember Li-Sa-X, a young Japanese guitarist who covered Racer X's 1987 instrumental shred tune "Scarified" on YouTube late last year. Video: 8-Year-Old Girl Covers Paul Gilbert/Racer X with "Scarified"